With days to go before the launch of Apple's Siri-powered HomePod smart speaker, Amazon will unveil changes to its own personal assistant, Alexa, likely to come in the form of new voice options. Owners of the HomePod -- shipping on Feb. 9 -- should be able to ask Siri to stream any files uploaded to iTunes Match, not just material hosted on Apple Music. Apple Kicked off promotional efforts for its new HomePod on Saturday with four short ads showing off the smart speaker's svelte chassis and unique LCD control panel. 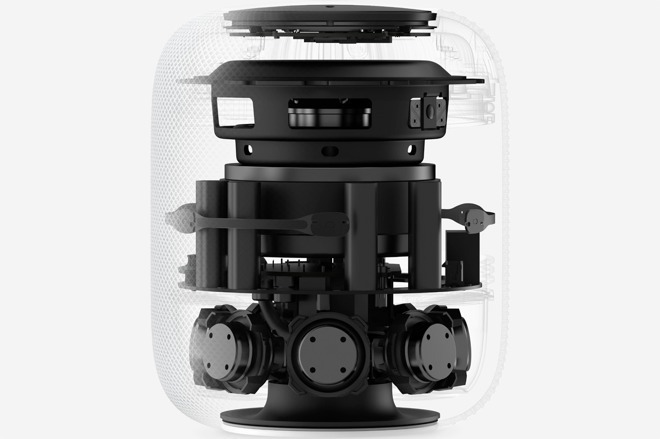 The HomePod stands to be an audiophile's ideal speaker when it ships on Feb. 9, in no small part due to the considerable effort Apple has put into audio processing for the device. Audio expert Matt Hines of iZotope explains some of the technical hurdles Apple and other smart speaker producers have to overcome to provide a high-quality audio experience in a wide variety of environments. Apple on Friday morning began accepting preorders for HomePod, the company's entrance into the smart speaker space with audiophile-focused premium sound. The $349 accessory will ship to users in two weeks, on Feb. 9. It's a mystery how high demand for Apple's HomePod will be, and it's also unknown how many units the company will produce for launch. Because of those unknowns, you'd better be ready come Friday -- and early. Responding to the imminent sale of the HomePod, Sonos has cut the price of the Sonos One, selling a two-pack of the speaker for $349 -- the same price as one HomePod. Not only can Apple's HomePod be used to control HomeKit devices, but it can take the role of a HomeKit hub, allowing for access and control of compatible peripherals from outside the home. Apple's HomePod, Files in iOS, and QuickTime Player in macOS all support FLAC playback, but Apple's media management tool iTunes still does not making it more difficult for Apple users to use the high-quality file format than it could be. Apple's HomePod will be shipping soon -- but beyond the features initially promised but not immediately arriving, there look to be a few more things coming to the HomePod in the future. AppleInsider gives you a full rundown of what to expect from HomePod in the weeks and months after it launches. Apple's HomePod is finally available to preorder this Friday, January 26th, and arriving in stores starting Friday, February 9th. AppleInsider delves into the device pre-release, and tells you everything you need to know before you drop $349 on it. Following the release of macOS 10.13.3 and new versions of iOS, watchOS and tvOS, Apple on Tuesday issued the latest version of iTunes for Mac, with the updated media software boasting support for the upcoming HomePod. Apple's HomePod may be shipping in the beginning of February, but multiple-room audio support and stereo sound between two HomePods will be absent at launch.